Leading off today: Playing with a leg brace because of a torn ACL suffered six weeks ago, Nico Morello passed for a school-record 430 yards and five touchdowns -- all in the first half -- Friday in his first varsity football start, a 47-14 victory for Eastport-South Manor over Amityville. "He's worked hard to get back," coach Chris Prokesch told Newsday. "It just show a lot of dedication and character to be able to come back and play any high school game. It's a real credit to him." Larry Cangro had 249 yards on five receptions and a touchdown in the win. Guy Buckley made three TD receptions. Picture getting clearer: Fifteen ranked teams suffered losses Friday -- many to other ranked squads -- as we gained some clarity on what the top of the New York landscape will look like when many schools start their postseason in two weeks. • No. 13 South Shore edged No. 5 Tottenville 33-28. • No. 19 Erasmus Hall downed No. 18 Midwood 6-0. • Unranked Harry Truman toppled No. 20 Lehman 14-8. South Shore senior quarterback Darius Thompson scored on a 32-yard run with 37 seconds to go in the upset of the Pirates. Tottenville had taken a 28-27 lead with 4:04 to play as QB James Kelly connected with Kolubah Pewee on a TD pass and Mike Jones ran in the 2-point conversion. Thomson's heroics completed a rally from a 20-6 deficit at the half. Heartbreaker for St. A's: QB Jayden Umbarger rushed for a 9-yard touchdown with 1:46 left and completed a 2-point conversion pass to Chris Clark to cap a 22-point rally in the fourth quarter of Archbishop Spalding's 43-42 win over St. Anthony's in Maryland. The Friars, ranked third in Class AA, had scored three touchdowns in the third quarter to bolt to a 42-21 lead against the Maryland powerhouse. More Class AA: QB Terrance Edmond had 17 carries for 185 yards and two touchdowns to lead No. 2 Freeport to a 39-12 triumph against No. 24 Massapequa. Justin Lescouflair added 14 carries for 103 yards and two touchdowns to go along with a 7-yard scoring catch. • Section 6 seems to grow murkier by the day. Orchard Park QB Jack Sharp found Archie Bartolotti for a 10-yard TD with 2:26 remaining to beat Buffalo Bennett 23-22. Bennett was coming off a victory against 2017 NYSPHSAA runner-up Lancaster last week. Canandaigua posts shutout: Junior Matt Vierhile turned a short hitch from QB Jack Johnston into a 43-yard TD reception in the second quarter to start No. 20 Canandaigua on its way to a 12-0 victory against No. 9 Victor. More Class A: Bryce Ford rushed for five touchdowns and added two passing touchdowns to lead No. 27 John Jay Cross River over No. 11 Our Lady of Lourdes 49-28. • Aaron Chase (24 of 40, 344 yards) threw a 57-yard TD pass to Matt Spina just nine seconds after Buffalo South Park broke a 14-14 tie, and No. 29 Starpoint went on to a 21-20 triumph over the No. 21 Sparks. Starpoint rallied from a 14-0 deficit after South Park converted a pair of turnovers into scores. • No. 30 Goshen earned its first win over No. 24 Warwick since 2004, pulling out a 14-7 triumph on the strength of Matt Giordano's 70-yard TD throw to senior Jack Kunis. • Playing just hours after the resignation of coach Mike Connolly, third-ranked Cornwall stormed past winless Hyde Park FDR 55-7. Freshman quarterback Aidan Semo threw for 238 yards and four touchdowns. Class B: Running back Ryan Romagnoli ran for two TDs and threw for one as No. 22 Cazenovia beat No. 24 Oneida 28-12. Romagnoli carried 19 times for 127 yards. Class C: Second-ranked Susquehanna Valley overwhelmed Newark Valley 62-0 behind 401 yards of total offense. QB Jarred Freije rushed five times for 111 yards and completed four of nine passes for 92 yards. Newark Valley, which hadn't lost a regular-season game since Week 6 of 2015, played without rushing leader Caden Bennett, who suffered an injury in practice on Thursday. Big numbers: Kevin Coleman ran for over 300 yards and five TDs as Pelham outlasted Poughkeepsie 57-42. ... Michael Tipping carried 16 times for 294 yards and six touchdowns for Millbrook in a 68-24 rout of Onteora. ... General Brown's Jake Heller (14 of 17, 230 yards) threw five touchdown passes -- four of them to Matt McManaman (six catches, 165 yards) -- during a 76-12 win over Thousand Islands. More notes: Averill Park is 6-0 for the first time in 25 years after a 54-27 victory vs. Amsterdam. ... Cheektowaga's 44-0 win over Lewiston-Porter marked its fifth shutout of the season to tie a 1949 school record. ... Alexander's Chris McClinic, a first-team all-state running back in Class D a year ago, was hurt in the Trojans' first series and did not return to the 26-6 win over Batavia Notre Dame. 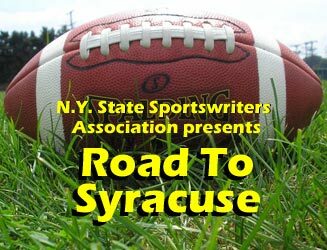 Scoreboard: You can check out all of the Week 6 scores and remaining schedule on our Road to Syracuse website.